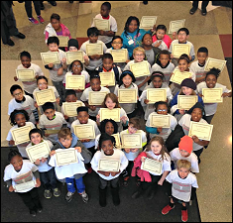 On Saturday, November 22, 2014, over 40 elementary school students from Maryland, DC, and Virginia gathered at the University of Maryland (UMD) for the Maryland Cybersecurity Center’s first Cybersecurity Workshop for 4th and 5th Graders. After an activity about staying safe online and an ice-breaker, the students were separated into smaller groups that rotated through four stations. The participants worked together on hands-on activities led by UMD volunteers, using both critical thinking and problem solving skills to complete a variety of challenges. The activities demonstrated a variety of important concepts in cybersecurity and computer science such as programming languages, networking, public key encryption, and cryptography. "In putting together the curriculum, it was a challenge trying to find a way to make complex cybersecurity concepts understandable at the primary school level, since we had not previously reached out to this age group,” said Veronica Rittie, the Undergraduate Assistant for Education at the Maryland Cybersecurity Center. “However, we were amazed at how quickly the students grasped the topics! The hands-on activities really resonated with them, and they had fun while they learned!." This workshop’s hands-on activities were led by UMD volunteers that came from the Advanced Cybersecurity Experience for Students (ACES), the cybersecurity honors program on campus, as well as from Flexus, an engineering focused Living and Learning program. Volunteers were happy to share their interests in cybersecurity while leading the workshop participants through engaging and thought-provoking activities. This program is one of many educational outreach programs offered by the Maryland Cybersecurity Center, all designed to encourage young people to pursue cybersecurity and other related fields. Future events for elementary students can be found here.